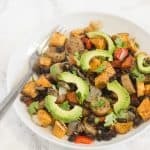 This one-pan chicken sausage sweet potato bake is an easy dinner that’s delicious topped with salsa and avocado! 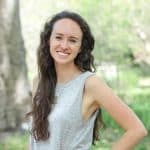 I know, two posts in one week? In a perfect world, I’d post even more often that that, but today I’m just happy to be back for the second time this week. Tomorrow, I’m leaving for a full weekend in the mountains! Which means that I spent yesterday packing and trying to decide if I could get away with not doing laundry before I go. Packing is one of those things that takes me forever and I still have a ways to go still, but I did at least pack all of my favorite, non-perishable travel snacks like dried figs, Larabars, apples, oatmeal, and dark chocolate. 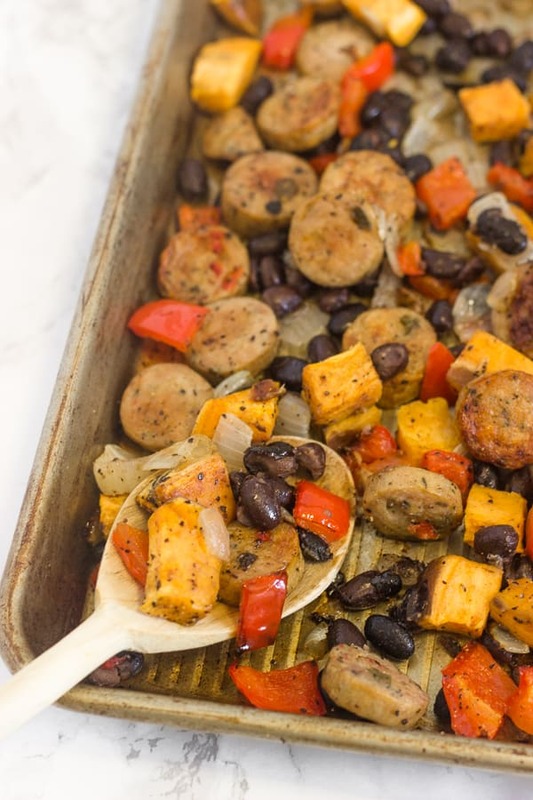 And speaking of food…let’s talk about this chicken sausage sweet potato bake. I wish the leftovers from this were still in my fridge! Last fall, I posted a recipe for one-pan chicken sausage and roasted veggies. It’s not one of the most popular recipes on the blog, but it’s a meal I love and make on a regular basis. It’s also one of those meals I’ve made for other people and they’ve asked for the recipe and have started making it, too. And having a food blog really comes in handy when people ask for recipes! The original recipe is really great. It’s a super easy, throw-whatever-veggies-and-sausage you-have-on-a-baking-sheet kind of meal. 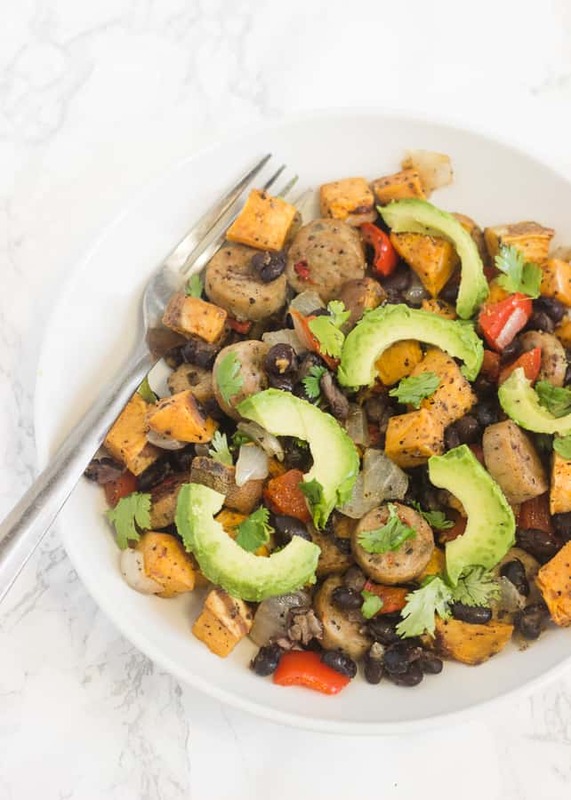 But then I had the idea for a southwestern-style one-pan chicken sausage sweet potato bake (mainly so I could top it with avocado and salsa) and I like this even better than the original. It’s really filling, relatively inexpensive, and tastes awesome. And if you leave out the black beans, it’s Paleo and Whole 30-friendly. I love the ease of using pre-cooked chicken sausage so I don’t have to actually deal with cooking meat myself. It’s such a big time and convenience saver! I especially love Trader Joe’s line of chicken sausage: there’s sweet Italian, sun-dried tomato, spicy jalapeño, etc. and they all have short ingredient lists. Most are also Whole 30/Paleo-friendly. This isn’t sponsored by Trader Joe’s– I just love their food, friendly cashiers, and generous samples. And their dark chocolate peanut butter cups. If you try this one-pan southwestern chicken sausage sweet potato bake, feel free to let me know in a comment or take a picture and tag me @livbane on Instagram. Hope you enjoy! Slice chicken sausage into 1/4 inch rounds. Chop sweet potatoes into small cubes. Chop bell pepper and onion. Transfer veggies to baking sheet and drizzle with olive oil and toss with salt, pepper, and garlic powder. Place in oven and bake for 20 minutes. While chicken sausage and veggies are in the oven, drain, rinse, and use a paper towel to pat the black beans dry. Remove baking sheet from oven after 20 minutes and add black beans for the last 10-15 minutes of baking time. Top with avocado slices and salsa and enjoy! This is something we can make on a busy weeknight. All yummy ingredients that taste great together! Plus, anything you can make in one pan! Yep, it’s perfect for a weeknight! Super hands-off and easy to make! I don’t know how you can make all these recipes in a dorm, but this dish certainly looks colorful…and like fall. Maybe you should give it to Trader Joe’s to give to their customers. I’ll be happy when I have my own kitchen next year for sure but for now, the dorm kitchen works pretty well!